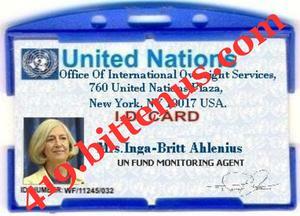 I AM MRS. INGA-BRITT AHLENIUS, THE UNITED NATIONS FUND MONITORING AGENT. FIRSTLY, I WISH TO APPOLOGIES UNBEHALF OF THE MONITORING TEAM FOR ALL YOU HAVE GONE THROUGH TRYING TO RECEIVE YOUR COMPENSATION FUNDS, WE WERE NOT AWARE THAT YOUR FUNDS HAS NOT BEEN RELEASE TO YOU AFTER APPROVAL OF YOUR FUNDS WERE SENT TO THEM, PLEASE ACCEPT OUR APPOLOGY. FOLLOWING OUR PREVIOUS PAYMENT NOTIFICATIONS, THE WORLD BANK AUDITORS ARE CURRENTLY IN WEST AFRICA TO VERIFY NUMEROUS COMPLAIN FROM THE AGENCY REGARDING SOME UNPAID FUND BENEFICIARIES WHICH YOU ARE AMONG, THE WORLD BANK TEAM IS NOW IN NIGERIA TO SUPPERVISE ALL UNPAID LOTTERY AND INHERITED FUNDS THAT ORIGINATE FROM THE UNITED STATES, EUROPE, ASIA AND WEST AFRICA COUNTRIES IN WHICH YOUR PAYMENT IS AMONG. THE WORLD BANK TEAM HAS MET WITH THE CENTRAL BANK FOREIGN PAYMENT OFFICER WHO CLAIMED IGNORANT OF DELAYING YOUR PAYMENT IN THE PAST BUT HAS PROMISE TO MAKE SURE THAT YOU AND OTHER FUND BENEFICIARIES RECEIVE YOUR PAYMENT WITHIN THE NEXT 48HRS. AFTER THE WORLD BANK PAYMENT RECONCILIATION WITH THE CENTRAL BANK FOREIGN PAYMENT OFFICER, YOUR PAYMENT FILE HAS BEEN IRREVOCABLY APPROVED AND HANDED OVER TO MR. CHIM OF THE DEBT SETTLEMENT UNIT WITH A PART PAYMENT OF $1.5M APPROVED TO YOU VIA ATM CARD PAYMENT, THE $1.5M HAVE BEEN PROCESSED AND PROGRAMMED IN YOUR NAME WITH ATM CARD# 5988241476163496 AND HAS BEEN PACKAGED FOR IMMEDIATE DELIVERY TO YOU; THE ATM CARD HAS NOT BEEN SENT TO YOUR ADDRESS BECAUSE THE DELIVERY AGENT IS STILL WAITING FOR YOUR ATM COURIER FEE TO DELIVER THE ATM PACKAGE TO YOUR DESTINATION ADDRESS. AFTER PAYING THE FEES VIA MONEY GRAM OR WESTERN UNION OR RIA, SEND A COPY OF THE FOLLOWING PAYMENT INFORMATION (1. SENDER'S NAME, SENDER'S PHONE NUMBER AND ADDRESS, 2. MTCN NUMBER OF THE PAYMENT, 3. TEXT QUESTION & ANSWER) TO MY EMAIL AND A COPY OF THE INFORMATION'S TO MR. CHIM (DEBT SETTLEMENT OFFICER) VIA BELOW EMAIL CONTACT FOR IMMEDIATE DELIVERY OF YOUR ATM CARD PAYMENT TO YOU.